For company profiles, 2014 has been considered as the base year. In cases, wherein information was unavailable for the base year, the years prior to it have been considered. The value chain of the emollient esters includes raw material suppliers and service providers. The leading players operating in the emollient esters includes Croda International Plc, Lonza Group Ltd, BASF SE, Evonik Industries AG, and others. The demand for emollient esters is largely due to growing personal care industry. This research report categorizes the Emollient Esters based on product, end users, and region. The report forecasts revenue and analyzes trends in each of these submarkets. The global emollient esters market is projected to reach USD 226.1 Million by 2020, at a CAGR of 5.4% from 2015 to 2020. The growth is primarily driven by the growing end-user such as skin care, hair care, cosmetics, and oral care. The growth of the emollient esters market is primarily being driven by the growth in end-user industries like skin care, hair care, cosmetics, and oral care. Also, factors such as changing lifestyle, growing consciousness for personal hygiene and increase in purchasing power of people for cosmetics & personal care products in emerging countries are expected to drive the growth of emollient esters market during the forecast period. In addition, the shift from use of oil based emollients to emollient esters is one of the reasons supporting the growth of this market. However, stringent labelling rules for cosmetic ingredients and availability of cheaper and greener substitutes of emollients are some of the challenges which may restrict the growth of the emollient esters market. Based on end user, the skin care segment accounted for the largest market share of the global emollient esters market, followed by the hair care. Emollient esters are also used in other products like toiletries, fragrances, and different pharmaceutical applications. Europe is the leading manufacturer of emollient esters, followed by North America and Asia-Pacific. However, Asia-Pacific is one of the fastest-growing regions for the emollient esters market. Emollient esters in this region is likely to grow at highest CAGR during the period. Apart from Asia-Pacific, Latin America is also expected to be an important market in terms of growth. The strong growth for personal care industry in Brazil and Argentina will contribute to the growth of emollients esters in Latin America. 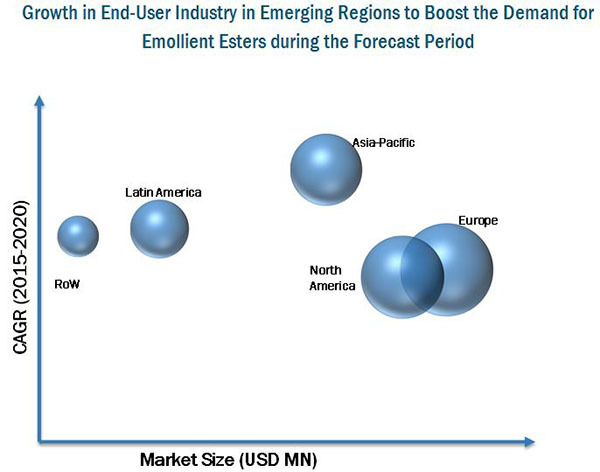 The emollient esters market in Asia-Pacific is expected to register the highest CAGR between 2015 and 2020. In the Asia-Pacific region, China and India provides a large customer base for personal care, cosmetic, and beauty products. In Latin America, Brazil remains a key market due to emerging trends in beauty and personal care industry. Manufacturers assess that rising awareness for health and hygiene will significantly contribute to the growth of personal care and cosmetic industry, which will indirectly drive the consumption of emollient esters in this market. The market of emollient esters is fragmented with few large players and a high number of smaller players. 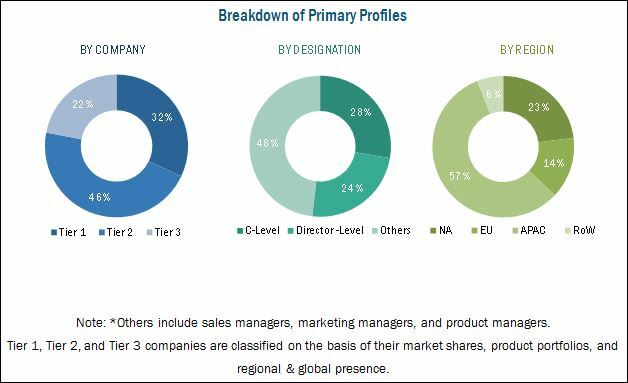 The organized players in emollient esters market have an edge over smaller players in terms of product offerings, innovations and distribution network. Leading manufactures for emollient esters are Lubrizol Corporation (U.S.), Stepan Company (U.S), Ashland Inc. (U.S.), Innospec Inc. (U.S.), Croda International Plc (U.K.), Lonza Group Ltd (Switzerland), BASF SE (Germany), Evonik Industries AG (Germany), and others.